The third annual San Carlos Treasure Hunters, The Lost Treasure of Wellington Sparks, took place on Saturday, February 7th. The event had nearly 300 participants combing the City of Good Living in search of the lost treasure. When the dust settled, the defending champs from 2008, were victorious. Four hours and three minutes after the hunt started, Sam Singh struck paydirt above the waterfall at Arguello Park, he and his two joyful teammates, Riley Quinn and Colin Jacobs became the first team to win the event in back to back years. 52 teams of kids and supervising parents started the hunt at Casa de Flores in downtown San Carlos. Five teams made it to the final clue location and engaged in a frantic search for the gold box holding the keys to the treasure chest. Team #41, “The Hippos” captained by Hannah Singh and Olivia Ong, were the second team to arrive above the old waterfall and search for the gold box. Team #14, “SC-3” captained by James Beekly, Matt Elliott and Jack Karasky arrived third, followed by Team #8 “Harris-Mier” captained by Kevin Harris, Scott Harris and Austin Mier and finally, the fifth to arrive at the dramatic final scene were the returning champs from 2007, Team #13 “SC Dons” captained by Sean Davidson and Garrett Yamane. Singh, Quinn and Jacobs produced the keys back at Casa de Flores and opened the treasure chest. Inside was $1,000, cash, which the teammates split. From start to finish the hunt took 4:03. In order to receive the final clue, which would hint at the location of the keys to the treasure chest, teams had to navigate their way ten secret locations. The secret locations were identified through clues. 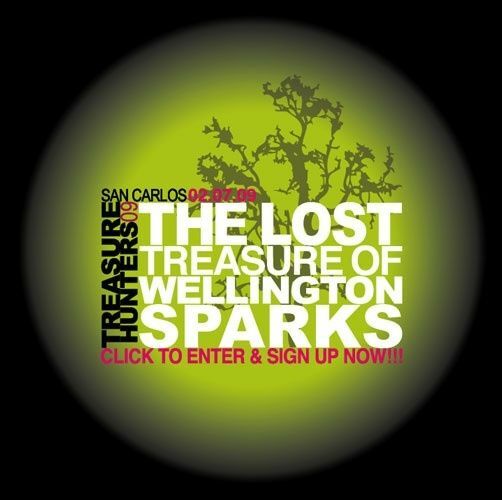 The clues are based on San Carlos history, our city parks and the fictional Diary of Wellington Sparks. Teams studied the San Carlos history book and visited all parks in preparation for the hunt. Those that studied hard made their way through the hunt at a faster pace. Four of the ten secret locations had a physical challenge that needed to be completed by the team and its supervising parent. A race to unlock 1 of 52 random combination locks and diving face first into a whipped cream sundae were just two of the fast-paced challenges facing the teams. For those that came up just short, get ready for San Carlos Treasure Hunters 2010. Myself and Young Orthodontics were pleased to hold this event in San Carlos and look forward to many more years of San Carlos Treasure Hunters. By clicking on the icon below, you can see the ten clues and answers which were navigated by the treasure hunters this past Saturday. Thanks again for providing this for our community! I know the boys on the team I drove had a great time and learned new things this year. My pleasure. I’m glad you guys had a good time. I hope we see you out there again next year.